‘Property Brokers Auctions’ was started, in Feilding for the purpose of selling farm machinery from beside the Feilding sale yards. 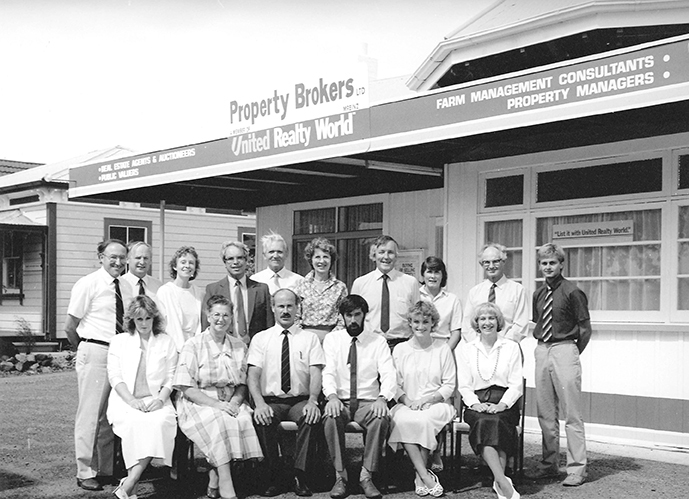 July 2006 - Property Brokers celebrates 20 years in business! July sees Property Brokers expand further into the Waikato opening the Te Aroha branch with a full suite of services including Residential, Lifestyle, Rural, Commercial and Property Management. February 2015 sees more expansion into the King Country/Waikato area, opening the Taumarunui branch, offering Residential Sales and Property Management. March 2015 Property Brokers opened a new branch in Wairoa, the northernmost town in the Hawke’s Bay region. Property Brokers expansion into the Waikato continues, opening a branch in Taupo. Property Brokers opened its new Head Office/Branch in Palmerston North, located next door to the original site of Property Brokers’ first office. Previously the Palmerston North teams worked out of four separate buildings. This modern, state-of-the-art building shows how far the company has come from its humble beginning. The Waikato is expanding again, with the opening of Tokoroa branch AND Morrinsville branch! Otaki branch became Branch 42 when it opened it's doors on 1 June 2018. July 2018 - Property Brokers purchased Realty List and Sell (previously trading as Ray White Taupo) doubling the size of the Taupo branch overnight.